Zina and I decided to go racing this year. The above pic pretty much sums up my 916, only the latest iteration has a few more things done... like the white number plates and Arrow 1/2 exhaust system. The initial prep included safety-wiring everything. This is IAW the rule book for our organization. Read the racing page for a link to WSMC. The 916 has like 24 hose clamps that need to be wired. That was the major PITA. I don't know if you've noticed, but I got the biposto tail section for street use. For track use, I change out to the original mono subframe and tail section. It probably would just be easier to use the same subframe and adapt both tails to work on it, but I didn't want to sacrifice the "street" subframe in the event of a get off. Then, I pull off the front fairings and the two screws that hold on the fairing stay. The stock fairing stay with headlights and left handlebar switch gear are removed. The first time, I rerouted the large wiring harness connector to go to the outside of the radiator to allow for easy swapping. Then I install the Graves fairing stay (with spare instruments and wiring harness) and the Sharkskinz bodywork. Last step is to change out the wheels. All told, it sounds easier than it is to accomplish. This is basically the core of my 916 racing program. Note that these parts are a bit separate from the other mods I've done to my bike. R&D kinda goes along with racing. Things break, bolts fall out, etc, and you learn from it. My coolant tank popped, so you should just bring a spare. I went through all kinds of rearsets. The DP ones don't offer the shifter enough freedom for me to really move the footpeg up. Then, the sharp edge of the rearset digs into your boot. Screw it, they came off. 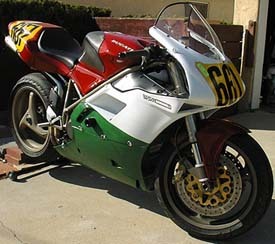 I bought some Woodcraft rearsets, but "retired" the 916 before trying them out. If anyone out there has a wrecked 996 on the cheap, let me know. Must have title and run. I wouldn't mind getting one that had a sound frame, motor, and forks. It would be nice if the tank still held gas, too. =) Otherwise, I've got all the stuff to bolt on everywhere else. So, not needed would be bodywork, tailsection, front fairing stay, rear subframe. For now, I'm racing Zina's "old" Aprilia RS250. We got her a prettier one that she'll be racing. So, I'm kinda giving up on racing the 916 for now. I'll be back; it was fun. I figure I'll get that 996 junker and do that.